Oh Lordy Lordy. The third Witcher game(Witcher being a word specifically chosen to drive spellcheck nuts) does not really disappoint. Yeah the game has problems, it’s got lots of the open world problems we see in the big open world games. But what it has going for it really feels worth the price of admission. So at this point a lot of RPG fans have had to accept that games can only be so good: if it’s open world it’s going to lose something on the story side, if it’s not open world we’ll get that well developed story and character development but lose out on an important chaos. 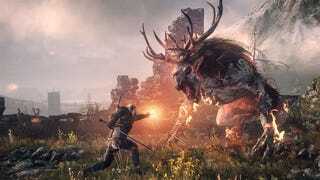 The Witcher 3 laughs at those problems and says we can have both. In life we get lots of choices and none of them really feel connected to the next. Games don’t have that luxury. Often the process of getting a game to work ends up with players being able to tell what their choices mean in the bigger game of it all. Witcher 3 is able to keep this chaos up where you really can’t tell what your actions are going to lead to. There isn’t that “choose A to good B to bad” feeling. You still definitely get these binary choices but often when it really starts to matter you feel like a terrible person either way. This leads to players really having to accept their choices. There can probably be clear guides written out to get certain things to happen, but what’s more interesting is how the game actually plays out. In a given area there will be several quests, and a few of these quests will connect to each other through lore or themes. So if you just do a few quests you can still get the gist of what’s happening in a region, but if you play more quests you get a deeper sense of the area. This would normally end up affecting plot progression, and it does in The Witcher 3, but really the plot will probably let you go before you finish the really climactic quests in an area. But this didn’t come from just following the main quest. If you look back you’ll see you got all these quests on your own, and you built up your knowledge of this on your own. Similarly the monster contracts have this same track where you investigate to find out how to fight a monster. Point being the game drops you in this chaotic world and demands you make your own sense of it. There’s this weird sorrow in the game. You can’t save everybody, sometimes doing bad things is the best option, sometimes the right thing is the worst option. It’s a world made up of greys. Sometimes you get a choice right and you get to feel good for it, sometimes you get a choice wrong. But the choices do matter and that’s powerful. The world is full of people who seem like real bad dudes but they’ll end up being allies while the little people turn out to literally be awful. You don’t get much out of making choices at face value. There’s a war on and what people have to do doesn’t really fit up with what they want to do.